Over the last few months or so I've been sharing my thoughts on the various subscription boxes that I subscribe to, and bar a few dodgy items, and a few hiccups here and there I'm still a huge fan of the concept, I love trying new things and I love the whole surprise element. Given the financial outlay and the risk element though, I can completely understand why some people don't like them. If you like the idea of trying new things but you aren't keen on the surprise element though there are a now a few options that able you to enjoy the beauty box experience without as much of a risk. 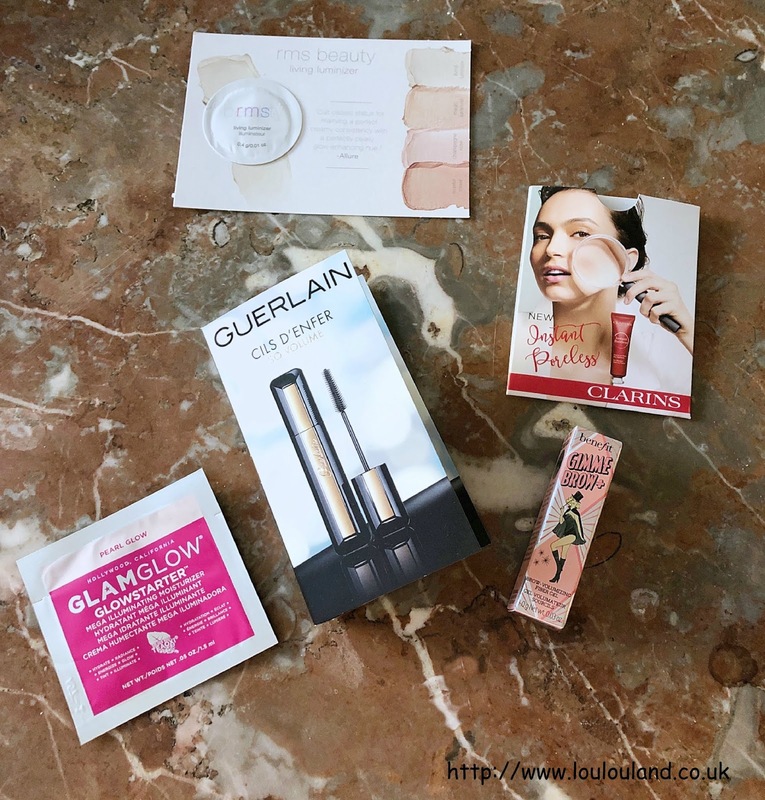 A lot of the beauty box companies such as Glossybox, Cohorted and Latest In Beauty do a lot of limited edition one off boxes, as do various beauty retailers including QVC UK, Debenhams, and even ASOS. The contents of these boxes is either clearly listed so you know exactly what you're buying or in some cases you can even choose what you want in your box. The fact that you know exactly what's in the box takes away that surprise element but since you can choose whether or not to buy it, it definitely takes away some of the risk. One thing it doesn't tackle though is the price issue, and if anything some of these one off boxes can actually work out more expensive than a regular subscription box, just having a quick look online the cheapest one off box I can find at the moment is £20 for QVC UK's TILI, not cheap and potentially still a pricey way to try something new. Fear for those of you who are watching the pennies but you fancy trying something new beauty wise, then there is another option. Now if you read my February empties post or if you've ever watched any of my You Tube videos, and then you'll already have heard about the Feelunique UK Pick 'n' Mix. 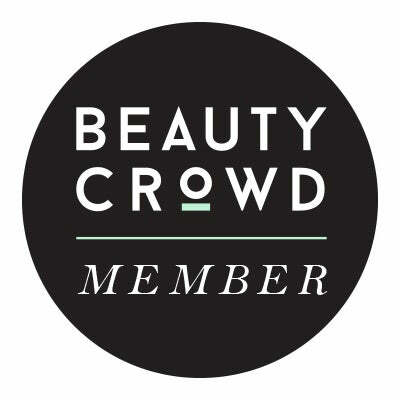 I don't know about you but I love Feelunique UK, their site features beauty products from over 500 brands including Clarins, Charlotte Tilbury, HUDA Beauty and Anastasia Beverley Hills, it really is a beauty junkies paradise. Apart from the sheer amount of choice on the website one of the reasons that I really love Feelunique is because of their fabulously proactive sampling policy. As well as the popular "try me" policy on certain items, you also get 2 samples on every order over £40, and they offer a fabulous Pick 'n" Mix service. It's exactly the same as buying some Pick 'n' Mix at the cinema only without the terrifying price tag. 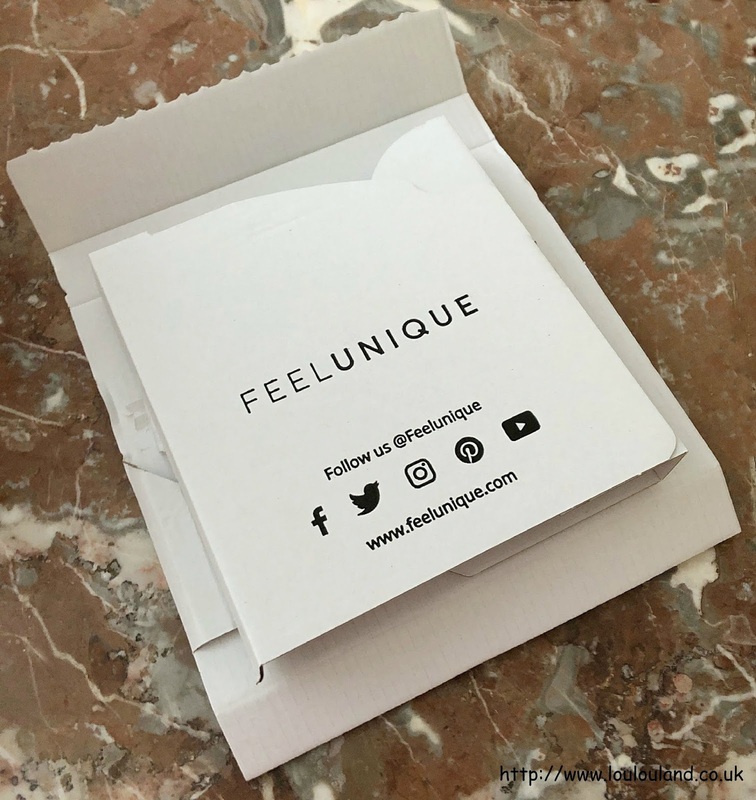 Feelunique UK allows you to pick 5 samples a month, from an extensive and ever changing list of everything from perfumes, to make up, and skincare products from all of their most popular brands for only £3.95 shipping and handling. It sounds a lot but after your samples have been dispatched you then receive an email from Feelunique containing a code, which entitles you to £3.95 off your next purchase, so it's pretty much risk free. Now I'm going to be honest some of the samples are quite small, they usually have not for sale printed on the packaging, and they are often samples that you could get on counter if the assistant was feeling generous that day. The website clearly indicates though the type of sample that you're requesting for example, a vial, a tube, a sachet or a card, and the size. I'd the first to admit that I don't get a Pick 'n' Mix every month but if I see something that I've wanted to try for a while, or even smaller or mini of products that I already love then I'll go for it. 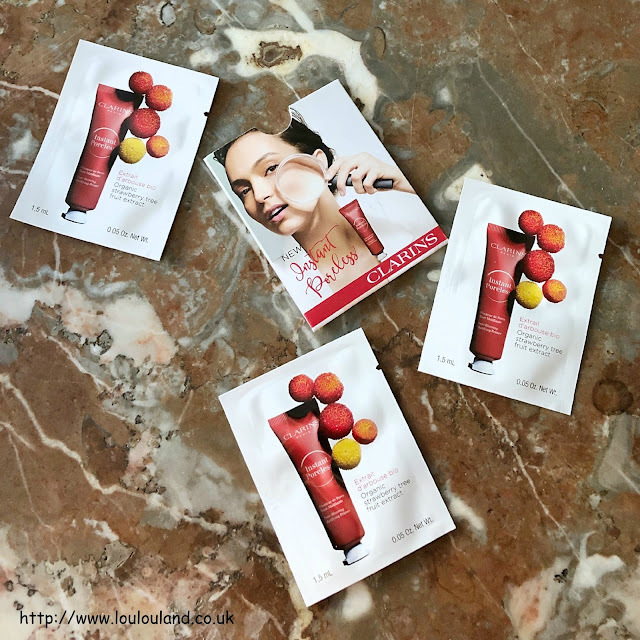 Now by looking at the sizes and so on you can often really good sized products such as the Sol de Janeiro Body Buff Smoothing Scrub 'N' Mask that I talked about in February's post. 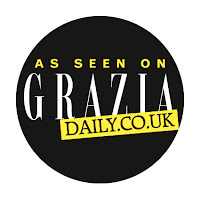 I've had all sorts from mini eye pencils, to decent size fake tan sachets and mini lip glosses, it really it worth keeping an eye on it to say what's new. If you have a look at my You Tube channel then you can see some of my previous samples but today I thought I'd share this month's selection with you. I haven't had a chance to try anything yet but I thought it might give you an idea of what was on offer. Now you don't get any fancy boxes with these, your samples will either come in a padded envelope or in a cardboard box / envelope like what you can see in the picture above. It's not about the packaging it's all about the contents and this is what I chose in March 2019. 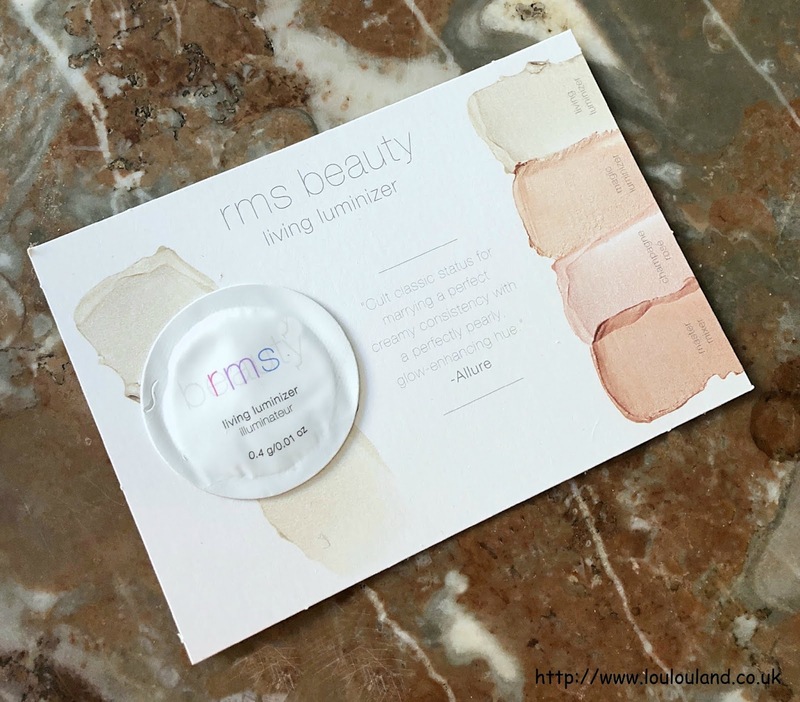 Even if you're a relatively new reader than you'll probably know that I have a bit of a thing for highlighters, so when I saw this one from RMS Beauty, I thought that I'd give it a try. Now I've tried anything from RMS Beauty before but I'm really liking their philosophy, their aim is to transform the way that women use make up, their products are made from organic, non toxic ingredients and designed to heal and nourish the skin. Containing almost skin care like ingredients such as castor seed oil, coconut oil, beeswax and rosemary leaf extract, this product apparently has a cult following, and promises a translucent, sheer, dewy, satin pearl finish. It's a carded sample so you don't get a lot, but there should be enough for a couple of uses on the cheekbones and maybe on the brow bone. The full 4.8g size retails at £36. From an out and out highlighter to a multi use product that can add glow and luminosity in all sorts of different ways. 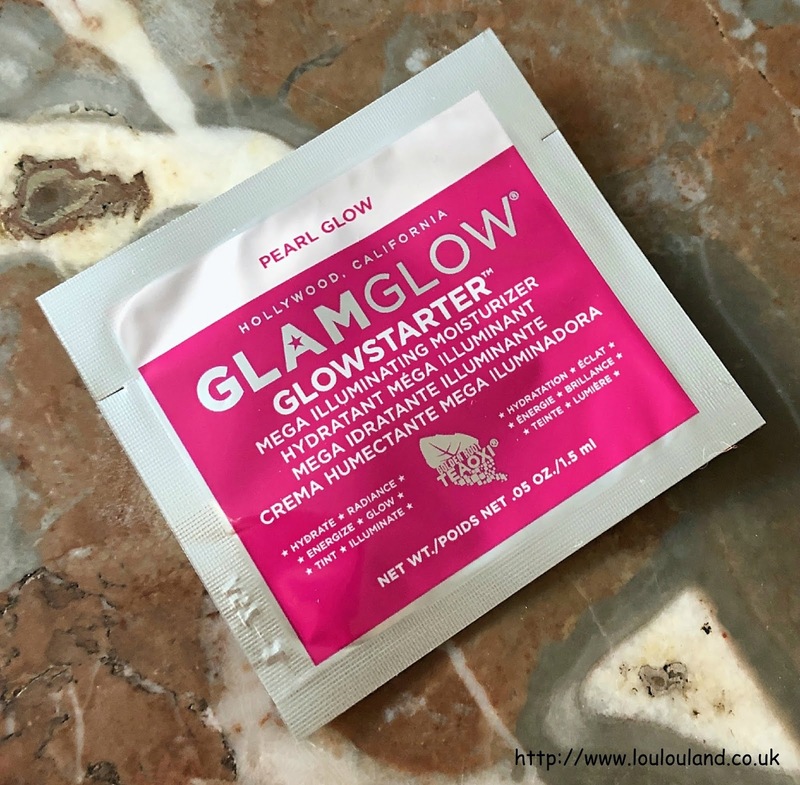 Founded in 2010 Glamglow are famous for their face masks, but this is something a bit different, it's a moisturiser and illuminator in one. It contains a mixture of botanicals including jojoba, Shea butter, and green tea ceramides, and hyaluronic acid, to add moisture, hydration and radiance to the skin. 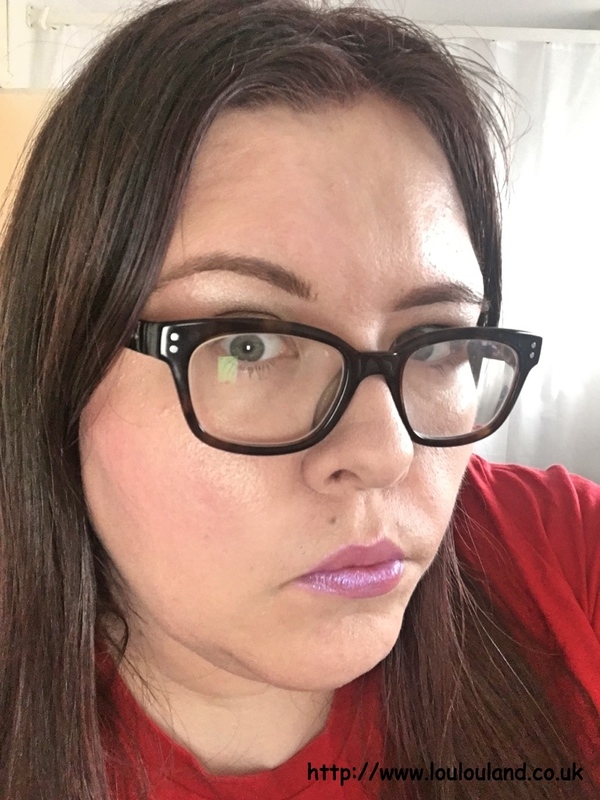 It comes in 3 different shades and this one, Pearl Glow appears to be the lightest shade and in swatches online it appears to be a shimmery creamy, white. You can use it as a moisturiser, and use it under the rest of your make up or you can wear it on its own, or you can use it as a highlighter and apply it to the cheekbones and where ever else you want to glow. This is a decent size sachet so hopefully I'll be able to get a few uses out of it. The full 50g size again retails at £36. Next up an item from Clarins - I used to use a lot of Clarins products but bar a few products, it's a brand that I don't really pay that much attention to any more, so I thought that this might be a nice way to try a new product, and to try and tackle a few issues that I have with my skin and make up at the same time. Despite being now in my early 40's (cry! ), my skin can still pump oil out like it's going out of fashion, and you could still on occasions drive a truck through my pores, so if a product promises to the matte the complexion down, and minimise visual pores and imperfections, I'm all over it .Containing organic strawberry tree fruit extract, this cream gel primer, apparently turns into a powder on contact with the skin and absorbs oil and sebum to minimise shine. Bring it on I say, and with 3 sachets, I've got plenty of product and time to see if it lives up to all of its promises. A full size 20ml tube retails at £24. As much as I like trying new things, I've sometimes used Pick 'n' Mix to pick up minis and travel sizes of products that I already love, and I do love a bit of Gimme Brow. It's the perfect lazy girl (or shattered, time pushed girl!) 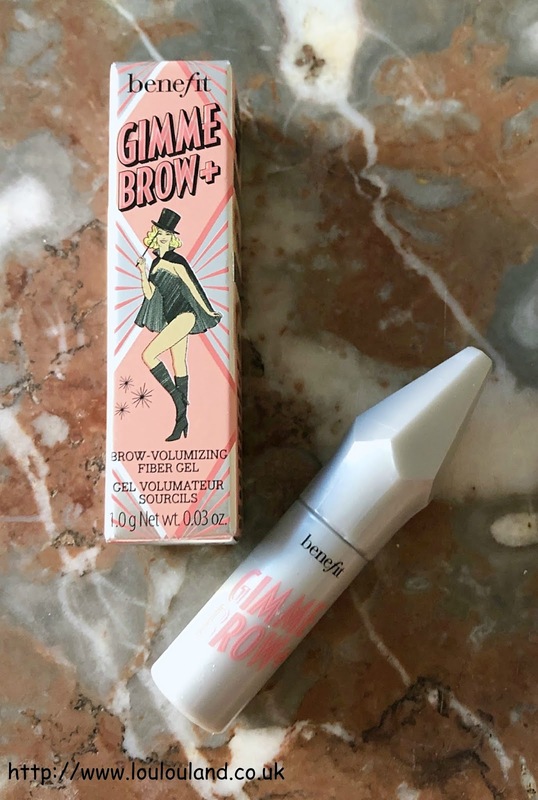 product, it add a hint of colour, thickness, and definition to the brows, as well as taming the strays, and stragglers and covering the occasional white hair! I'm usually a 4 / 4.5 in Gimme Brow now but this colour is perfect for when I don't want and obvious or full on brow or for adding a bit of definition and highlight. 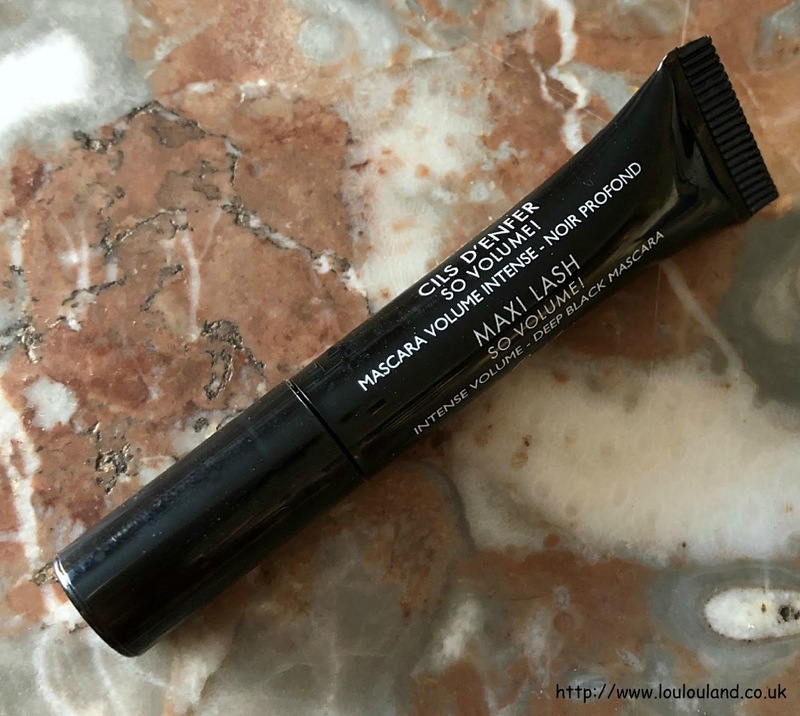 This is a good size tube and it would be ideal for trying the product for the first time, without too much of a risk. The full 3g size retails at £21.50. 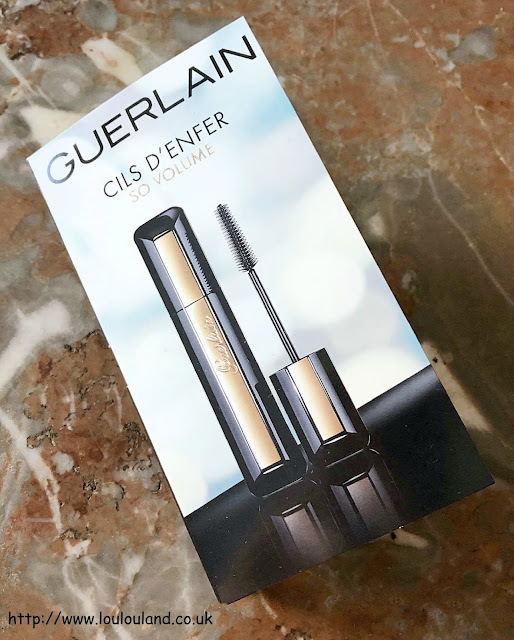 Finally a product from Guerlain, now despite the fame and cult status of their Meteorites, I think I've only ever owned one of their products and that was a lipstick, so when I saw this, being the mascara junkie that I am I added it to my sample selection. 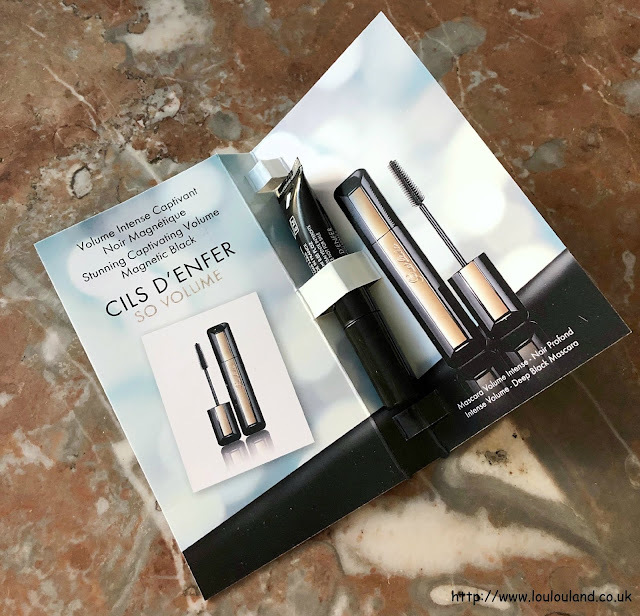 Again it sounds really impressive, it's designed to intensify and enhance the eyes, by adding condition, thickness, and volume, and all without running or smudging. I can't wait to give this a go and whilst mini tubes like this don't always give you a true picture of the wand, it will definitely give me some idea of the formulation. The full 8.5ml size retails at £28.